This lot contains three blue New York Mets batting helmets worn during the 1980’s and 1990’s. 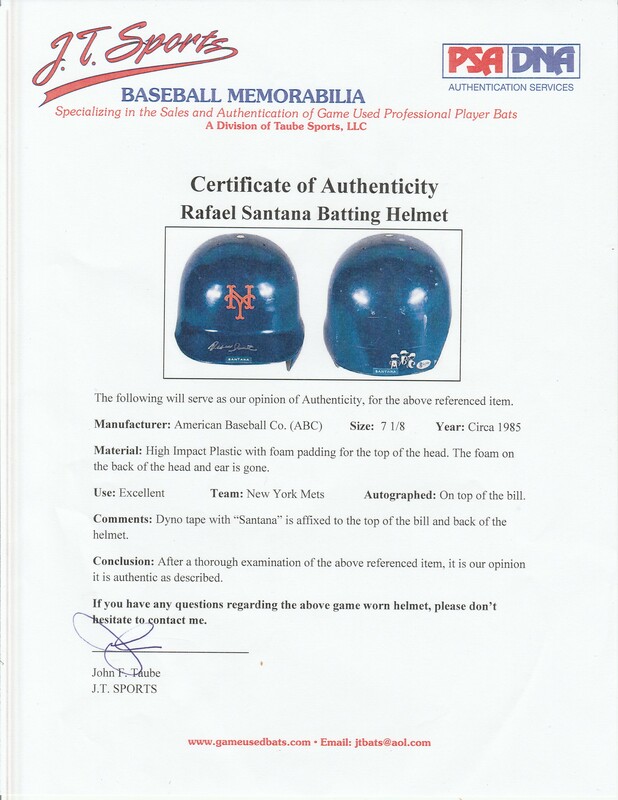 The first helmet was worn by Rafael Santana. This helmet has the Mets orange logo applied to the front, and a “Santana” label applied to the brim and back of the helmet. This size 7 1/8 helmet has a flap over the left ear. Please note that padding at the back of the head is missing. Santana has signed the brim of this helmet in silver marker. The second helmet in this lot was worn by Kevin Mitchell. 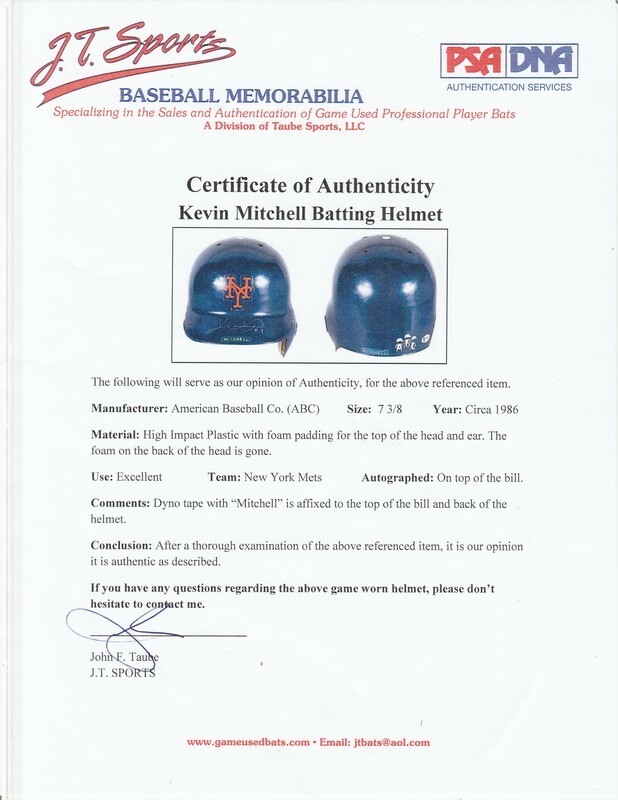 This helmet has the Mets orange logo applied to the front, and a “Mitchell” label applied to the brim and back of the helmet. This size 7 3/8 helmet has a flap over the left ear. Please note that padding at the back of the head is missing and the padding on the ear flap is loose. Mitchell has signed the brim of this helmet in silver marker. The final helmet in this lot was worn by Sid Fernandez. This size 7 helmet has a flap over the right ear and the Mets logo applied to the front. 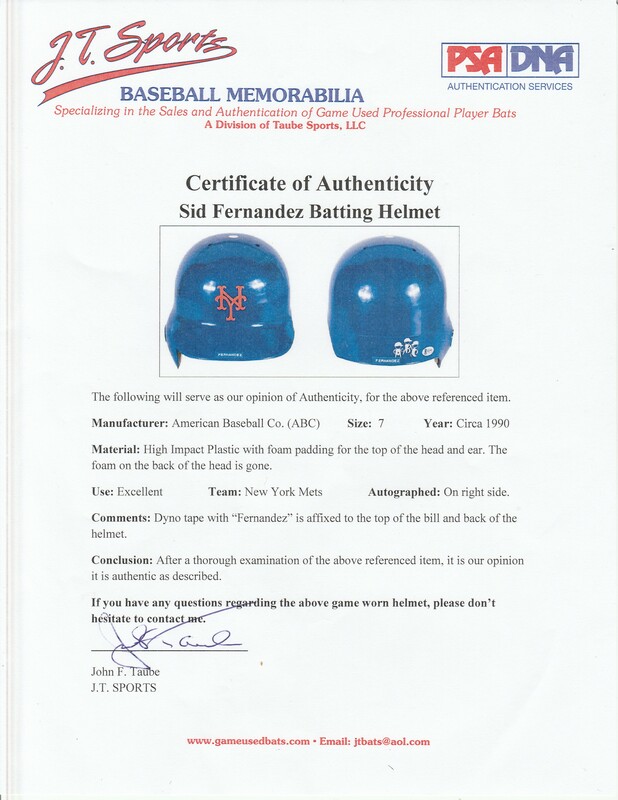 A “Fernandez” label is applied to the brim and back of the helmet. Please note that padding at the back of the head is missing. Fernandez has signed his name in black marker above the ear flap. He inscribed “50#” after his signature. Each helmet in this lot comes with a COA from Beckett Authentication Services (F63950, F63951, F63952) and a LOA from JT Sports.